I found a recipe on Pinterest for a Basil Gin Fizz (from the Set the Table blog.). Since I had some basil growing in the garden, this seemed like the perfect one to try. Note: As much as I would love to claim supreme gardener status, I did not grow that basil from seed. Nope - it was a Trader Joe's basil plant that I just planted next to my tomatoes - that I bought on sale from CVS. So, I had a recipe to share, but I do love the cocktail-character pairing so I now had a new dilemma: which fictional being would I toast with this cocktail? Amelia Gray, the Graveyard Queen from Amanda Stevens' Southern Gothic series. I've written before of my addiction to this series. It is seriously angsty book crack that I can't put down once I start. 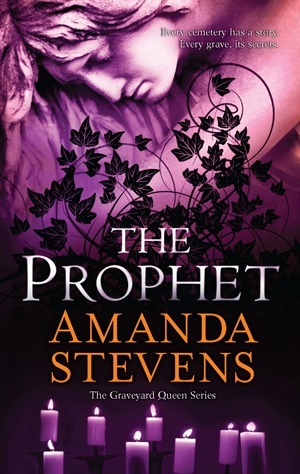 I got some gift cards for Christmas and bought book 3, The Prophet, but have been saving it. I've cleaned off the patio furniture, the weather is nice, and I foresee myself sitting in a chair, reading the continuing adventures of our intrepid cemetery restorer, and drinking Amelia's Berry Basil Fizzy Gin. Want one? Read on after the break. Note: As always because I'm cheap as hell, I bought whatever gin was on sale. This one actually had a pretty bottle. Bonus. Muddle the basil, strawberries, lemon juice and honey. Add ice, gin & club soda. Garnish if you are feeling fancy. Now I am ready for an afternoon of reading. Which character would you want to toast? Note (last one I promise): I seem to have a fixation with cocktails involving strawberries and green-leafed herbs. I am OK with this. Have some recipes you think I should try? I'm getting ready so I can read book 4 as soon as it comes out! I recognize that dish. I have the matching salad servers!